Innovation is the main concept of our Sanyastor brand. We are committed to providing our consumer with high quality and cost-effective products, which aims to make the consumers really feel the charm of the product itself. 1:material has natural leather smell, but it will disappear in a few days exposed to outside. 2:There is a little smell from the new bag normally, it'll be dispersed through air.Sequins have many colors and can swing freely to change color. 3:1-2cm error of measuring is a reasonable range due to different measurment methods. 4:Please allow little color difference due to different camera or light environment. 5:If you have any questions, please feel free to contact us, it will be our great honor to hear from you. 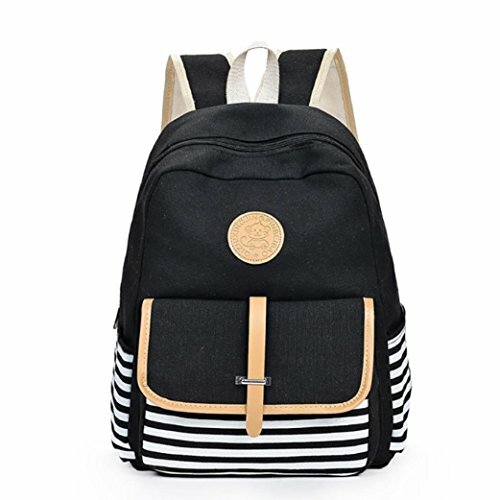 This Unisex Durable Laptop Backpack bookbag is made of high standard lightweight waterproof Nylon & Polyester with premium leather trim and high-quality metals; more than that, this backpack is also crafted with exquisite linen sealing and delicate details.used as school bag by students, for travel, for shopping and other daily use to achieve different functions. NO-RISK WHEN ORDER:Return(within 30 days), Exchange(The first 60 days). Any problems with your bag, please contact us. We will solve it. The actual color of the backpack maybe have little different from the picture due to the different screen of display or reflecting light when shooting.